Watching Movies Using Creator Nxt 3? Does Creator NXT 3 have a software you can use to play movies that have already been downloaded to my computer? 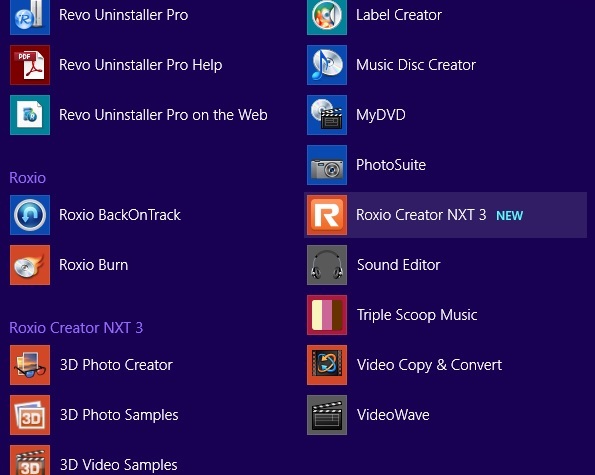 Last year, I upgraded my Roxio Creator 2010 to Creator NXT 3. I have it in my Windows 8.1 laptop. It is working fine with what I usually use it for, which is retouching and refurbishing old photos. I recently decided to watch some home videos that I have saved in my computer, but I can't find the software I used to use for that when I had either Easy Media creator 9 Suite, or maybe Creator 2010 (don't remember for sure which one had it) It was something called Cine Play which was part of Roxio Media Experience. I checked all the Roxio apps that where created when I installed this NXT version, but can't not find such a thing. I also looked in "Search" and in Google, and all I can find is some Cine Player that is some kind of decoder that you can buy separately. I am not sure if that is the same thing. Can someone tell me if NXT 3 have this software or something else that I can use just to watch the home movies I save to my computer? I am fine with DVD's, and Windows Media Player will play most of them, but I really like the platform of the Roxio player. Besides, I am not sure If I will be able to use WMP when I upgrade my computer to Windows 10. I have Toshiba Satellite laptop with Windows 8.1, IE 11, Webroot AV. WINDVD only play non copy protected DVD's. Is was part of the content disc did you install it? I did an automatic install where every thing gets downloaded, opposed to a custom one, but I don't see this WinDVD any where in my computer. So it seems that I did not get it.. Attached is a screenshot of the files I got after install. I must say, that I have reinstalled the software after some computer place uninstalled and reinstalled my Windows, and left me with a clean hard drive. I have a Roxio disc, that I got when I bought the software last year, but I had saved my downloads, and that is what I used instead. I can't tell you for sure, but I don't think I had this WinDVD before either. I checked 'Search" again, and I see there a number of these WinDVD in there, but I have no idea which one is the one that will play my DVD's and work with Windows 8.1, or even if I should try any of them. I hope you can give some advice. If it is supposed to come with my download, would there be some way to still get it? I also found today that my Windows Media Player is not playing my home videos either, as I thought it would. It plays the movies I have downloaded in my computer, but it wont play my DVD's.